View More In Business Card Scanners. The Docket PORT 687 scans media at up to 600dpi and its compact footprint fits in any office workstation. It can scan both sides of ID cards, driver's licenses, and embossed credit cards in one pass. This duplex scanner is USB powered so it will run off a desktop or laptop computer. Included software makes it easy to scan images into PDF, JPEG, and TIFF file formats. 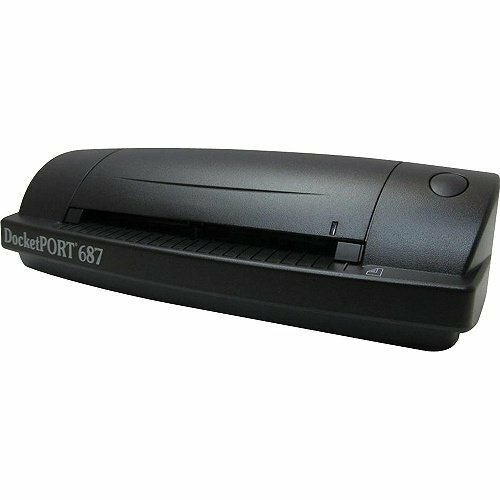 The Docket PORT 687 comes with a limited one year warranty and is durable and reliable for environments that demand high-volume scanning. WorldCard Pro Business Card Scanner (Newest Version), Outlook Support, Multiple languages. Bundle with Hot Deals 4 Less Premium Portable Power Backup Charger for ultimate portability.